The International Spine Institute offers patients least invasive spine surgery featuring stem cell therapy and endoscopic spine surgery. These procedures return patients to their lives quickly, with minimal pain and recovery as possible. 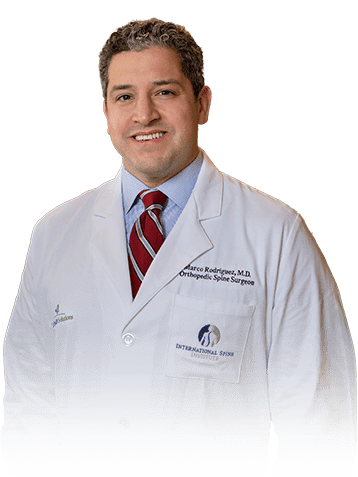 Marco A. Rodriguez, MD also specializes in artificial disc replacement and minimally invasive spine surgery, an excellent secondary treatment option for advanced degenerative and unstable spinal conditions. 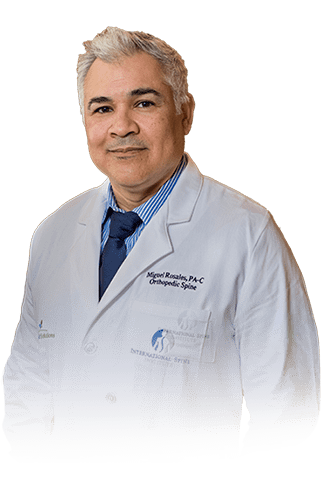 Board-certified and fellowship-trained orthopedic spine surgeon, Dr. Rodriguez treats degenerative spinal conditions including herniated disc, sciatica, spinal stenosis, low back, and neck pain. Regenerative stem cell therapy is an innovative healing option using the body’s own stem cells to treat low back pain. 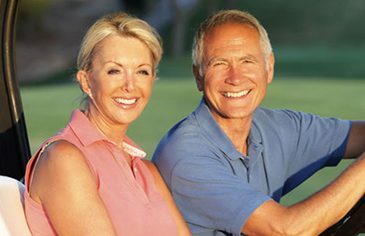 Stem cells are an excellent alternative to minimally invasive spinal fusion surgery. Least Invasive Spine Surgery is often more effective than minimally invasive spine surgery because of a smaller incision and quicker recovery. 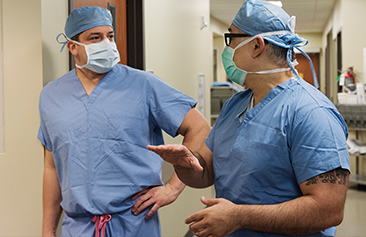 Our least invasive spine surgery options tailor treatment to our patients that have the fastest recovery time, return to work, play, and a pain-free lifestyle. Least invasive spine surgery is an emerging philosophy that bridges the gap between pain management and spinal surgery. 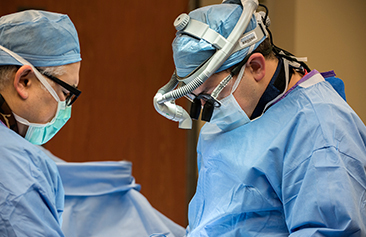 International Spine Institute does offer minimally invasive surgery when appropriate, but most patients prefer our least invasive options first. Least invasive spine surgery is an excellent alternative to spinal fusion and should be exhausted before ever considering MIS surgery. 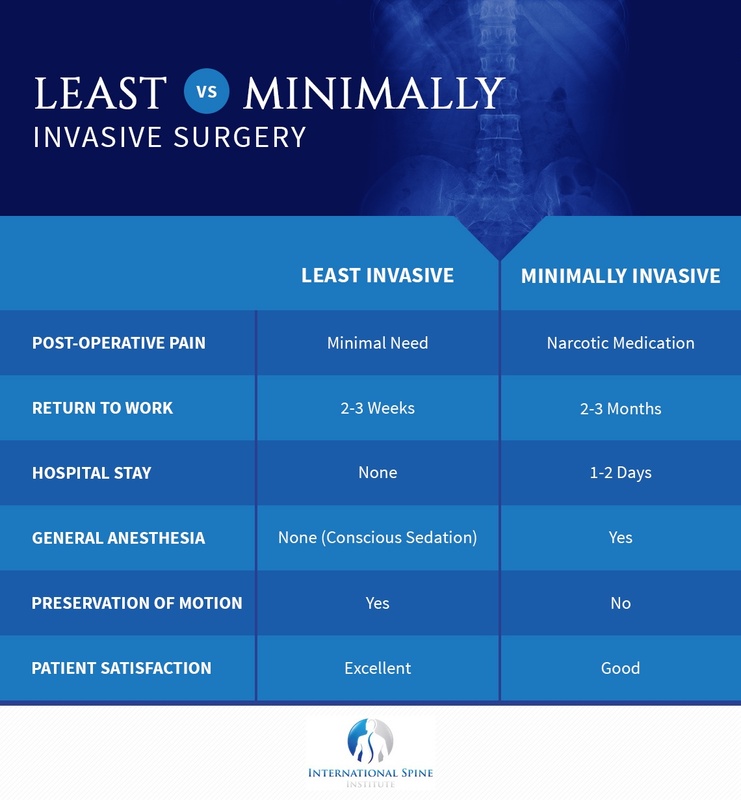 Results of least invasive surgery have significantly decreased the patient’s return to work (2 weeks) and recovery time compared to MIS surgery. Endoscopic spine surgery has similar outcomes to MIS surgery in providing pain relief of symptoms. 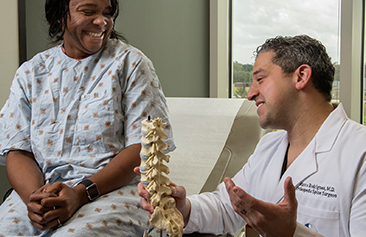 International Spine Institute serves the greater Baton Rouge and New Orleans areas, and medical tourism patients willing to travel to Louisiana.